Oh dear. This whole "3D" thing could have a little more trouble getting off the ground if research by Britain's Eyecare Trust is on the money. "3-D technology relies on our eyes' ability to work together as a co-ordinated team to achieve an accurate perception of depth," the report says. "However, more than one in ten of us (12%) has a visual impairment that means our brains are unable to correctly process the individual images that are transmitted to it via our left and right eyes. 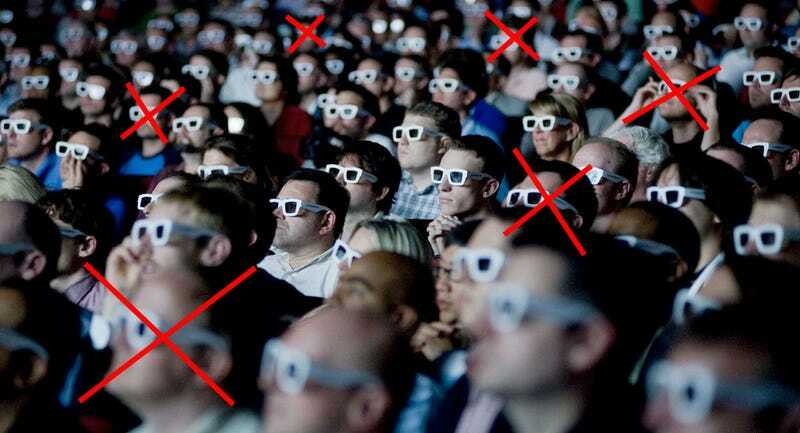 This leads to an inconsistency in viewing the three spatial dimensions (height, width and depth) required to enjoy 3-D films in all their glory." I've heard this more than once, both from readers and from friends and family, who tell me that for one reason or another, 3D effects either aren't as strong for them, don't work properly, or don't work at all. While this is a British study, I'd be shocked if the results weren't very similar across the rest of the Western world. And if that is the case, it certainly makes 3D a tougher sell than it already was.